Outdoor electronic led displays, led signs have proven to increase business 15%-150% at 10% the cost of TV, Radio and Newspaper advertising. PLUG AND PLAY SYSTEM: you will receive a complete system. You will only need to plug into a power socket, prepare and load your presentation (through a user friendly software - included with the product), mount (easy mount system included) and display to your customers. PROGRAMMABLE: easy to programme by the professionally developed and user friendly software (you can download a demo version from our website). The computer is needed only for loading a presentation - which then can be stored for years. You can pre-progarmme up to 8 separate presentations displaying at pre-determined times - perfect for targeted audiences and to manage effective commercial time for when you have a targeted campaign. FULL GRAPHICS & ANIMATED: create animations to attract people's attention by adding .bmp images from your computer or make them using the provided software. Display your company logo and/or any monochrome picture. THE BRIGHTEST LEDs: triple ultra bright LEDs. We use new technology LEDs, which are used to build new traffic lights. LED advertising is visible even during day time. 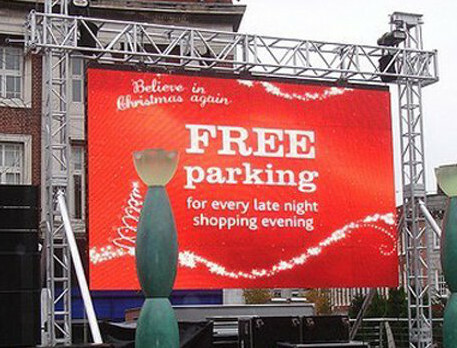 The brightness of our LED Signs or LED Displays can be easily adjusted using the included software. ANY SIZE: we make our LED Signs and LED Displays in any size (according to the size of the standard casing). The dimensions of your LED Sign can be easily extended, even well after your initial purchase. ANY TEXT & ANY LANGUAGE: display text in any font or language that is available on your PC (easy to install using Microsoft Windows). It is a great opportunity to target the Hindi, Arabic, Polish and any other foreign language markets. Moreover you can scroll up to 30 miles of text and if you need more, we can install more memory and upgrade your system. Single or multi lines of text and graphics can be easily created by the provided software. DISPLAY CLOCK, DATE & TEMPERATURE: these features are already built into our products. People like to know what time or temperature it is, therefore by displaying these features you can attract attention to your advert every single hour in every day. DESIGNED FOR EXTERNAL USE: our products are water, snow and humidity resistant. Designed to work in extreme environments. LED Signs and LED Displays can also be used indoors. Installing indoors at your entrance and it cannot be missed by any passer-by. VANDAL-PROOF: all our products are built in aluminium casing and the LEDs are set in double layers (inside and outside) of advertising foil (the outside layer can be easily replaced by new foil available from any advertising consumables supplier). They are resistant from attack by stones, paint, etc. BE SEEN FROM HUNDREDS OF METRES: recognized as the most cost effective advertising media by government statistics. Having a good location will allow several thousand people to see your advertising every day. Our LED Sign and LED Display can be clearly seen from a long distance, even during day time. Readable in full sunlight! Advertising & programmable, graphic & animated, moving & scrolling, outdoor & indoor, with temperature, clock & date, single line & multiline LED Sign IN ONE PIECE. Everything that you need to run your LED advertising display is included. You do not need any extras and it is easy to hang yourself. You are buying a COMPLETE ADVERTISING SYSTEM. Our smart designed LED outdoor electronic sign will attract your daily passers-by or drive-by audience with dazzling messages or images even from a good distance away. Generating awareness and creating interest for your business and products using the latest advertising media. Effective, professional advertisements that cannot be overlooked. The brightest advertisement on the market ! Readable in direct sunlight, very bright and exhibits excellent colour contrast. We deliver quality LED billboards at an affordable price. Become a recognised business in your city, town, or any crowd event. LED BILLBOARDS: so-called led moving signs, led displays, led digital moving message, diode boards, led programmable message centre, electronic text and graphic led panel, signage applications, led vision text, electronic message centre - EMC, London Outdoor promotional text graphic displays, electronic marquees, the UK led sign display billboard, multi-line led display, led advertising electronic led signage outdoor signs large led display electronic led signs signage board, etc.